University policy mandates that all research staff engaged in human subjects research are appropriately trained in human research protections. Also, all staff having contact with patient information are required to complete training on the protection of personal identifiable information. Research staff performing CRC functions are hired using different HR titles, any staff member performing function(s) related to human subjects research for which the IRB would require CITI and/or HIPAA training are required to complete the Penn CR: Onboarding and Certification Program. The onboarding program will provide comprehensive training in accordance with Good Clinical Practices (GCP) for investigator-initiated, industry-sponsored and grant-funded clinical research. It will present best standards of practice and regulatory requirements for critical job functions of the Clinical Research Coordinator and methods for achieving these standards and requirements. The requirements of both programs are listed below. Who should take the Penn CR: Full Onboarding Program? 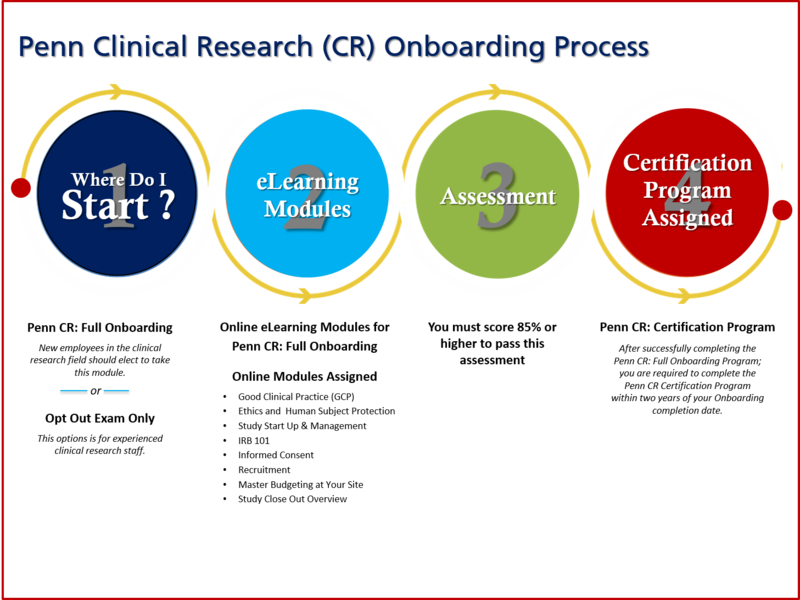 All Clinical Research (CR) staff are required to complete the Penn CR: Onboarding Program offered by OCR within 2 months being assigned the program in Knowledgelink. The program, including all modules and completion of the exam, takes approximately 12 hours to complete. The program is required to be completed within a two week period from hire date. There are no printed materials, and the course is entirely online. Do I have to take all of the eLearning modules? If you are conducting human subjects research, you must complete all of the listed onboarding e-learning modules. The onboarding exam must be passed with an 85% or greater. If you fail the exam, there will be one-on-one remediation to review the concepts incorrectly selected on the test. Post remediation, you will reschedule to retake the exam. Who should take Onboarding Program? Experienced research staff who has experience in the foundational concepts of clinical research and have worked in the field for several years may choose the Opt Out option for onboarding. There are reference materials that you may choose to review at any time under the e-Learning section of the Office of Clinical Research website. If you feel that you have solid foundational knowledge of clinical research, please click here to schedule time for the opt out exam. Please note this is a one time only exam for which you have 1 hour to complete. The program is required to be completed within a two week period. While you are not required to take any of the e-learning modules prior to attempting the opt out exam, you may use them as a resource by visiting the e-Learning section of the Office of Clinical Research website. The opt out exam must be passed with a 90% or greater. If you fail the exam, you will be required to take the Penn CR: Full Onboarding Program within 2 weeks, including the Penn CR: Onboarding Exam (scheduled in Knowledge Link). Who should take Certification Program? Once you have completed the full Penn CR: Onboarding Program, or pass the Opt Out exam, you are required to complete the Certification Program within 2 years of hire. Certification will be looked upon favorably when considering job advancements at Penn. 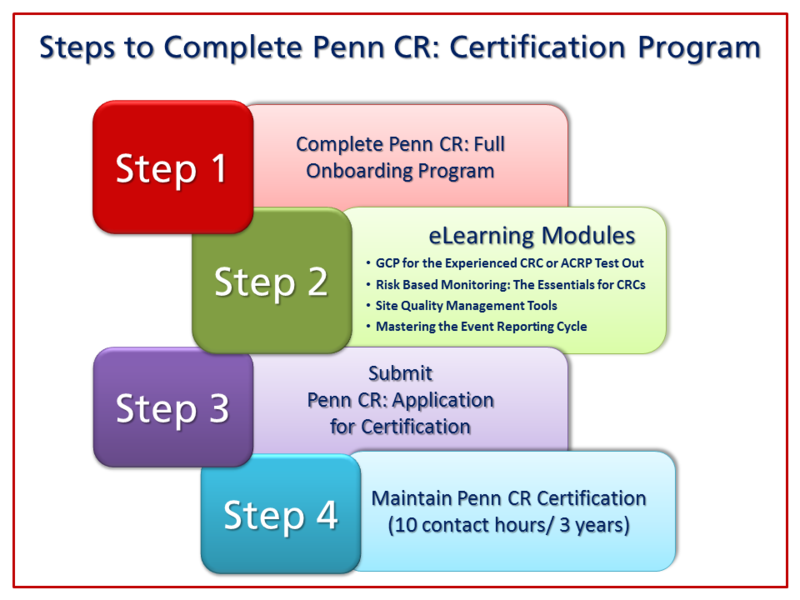 For staff that has previously completed the Penn CR Foundations course and has been certified prior to April 1, 2016, you are only required to maintain your current Penn CR Certification status and not required to enroll in the Penn CR: Onboarding and Certification Program. You may take the above mentioned modules towards maintenance of your certification status. There are 4 e-Learning modules listed above that are required for the certification, which will take a total of 6 hours. There is an ACRP Test out option for GCP for the Experienced CRC. In addition, you must complete four additional hours by taking either human subjects research workshops, ACRP, or OCR modules. After all requirements have been met, submit the application for Certification. For a more detailed description of each module click here. OCR has some sample tracks that can be taken for completion of certification by clinical research support staff based on their job role or function. Examples include Monitoring and Sponsor Support, for more details view the eLearning section. There is no exam for the Penn CR: Certification. The Penn CR: Onboarding Program is valid for 3 years. At the end of the 3-year period, participants must continue to partake in taking Human Subjects workshops. 10 hours of online and attendance at research related educational offerings (these workshops can be either offered by Penn or by an external vendor). Applications for renewal status can be found in the Penn CR Application for Onboarding and Certification. Can I still finalize my certification if I have completed the 2-day Penn CR: Foundations course? Yes. If you have completed the Penn CR Foundations course, you will need to take the Penn CR Assessment test in Knowledgelink (KL) and have four hours of Human Subject Research training (HSR). We currently offer eLearning modules in KL that will provide you with these HSR workshop hours. Each eLearning module has the amount of contact hours within the description. Do I have to be part of the Onboarding Program to watch the e-learning modules? No. The Office of Clinical Research has an entire catalog of resources for you to view under the eLearning section of the website. However, taking these modules outside of the assigned Penn: CR Onboarding program will not provide you with credit towards the Onboarding program. What are the benefits of taking the eLearning modules OCR is providing? Why did the Penn CR: Certification Program change? Capacity and Consistency – Using eLearning allows educators to achieve a great degree of coverage for their target audience, and it ensures that the message is communicated in a consistent fashion. This results in all learners receiving the same training. High Learning Retention – Blended learning approaches result in a higher knowledge retention rate. It also helps that coursework can be refreshed and updated whenever needed. Flexible – Using eLearning, we give employees the freedom to learn at their own convenience, and at a pace that is right for them. Can you use external research-related credit hours toward your certification? Yes. You are required to submit verification of any external research related course and/or seminar to the Office of Clinical Research for approval. Is this the same as the certifications offered by SOCRA and ACRP? No, this certification is not recognized nationally - only at Penn. The purpose of this certification is to provide the coordinators at Penn with a centralized training program in an effort to improve the quality of research, efficiency of conducting research, and the safety of human subjects at Penn. Is this certification required by Penn? The Penn CR Certification is not required. However, the Penn CR Onboarding Program is required for all research staff. Dr. Emma A. Meagher, Vice Dean for Clinical Research & Chief Clinical Research Officer of Clinical Research has mandated the Penn CR Onboarding Program hosted by the Office of Clinical Research per the attached SOP titled “Clinical Research Training for PSOM Faculty and Staff.pdf”. The Institute for Translational Medicine and Therapeutics (ITMAT) offers educational programs at the undergraduate and postgraduate levels, organizes an annual international symposium, seminar series, and various workshops focusing on emerging topics in translational research. The ITMAT/CTSA Educational Programs are directed by Emma Meagher, MD and are designed to recruit, train, and nurture a new cadre of professionals with defined expertise in clinical and translational methodology. There are several educational programs including Masters in Regulatory Affairs (MRA), Masters in Regulatory Science (MSRS) and Masters in Translational Research (MTR). 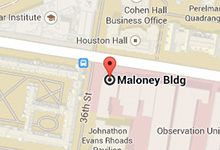 Please visit the Institute for Translational Medicine and Therapeutics website for additional information.